At its most basic level, Mappin takes data from a WMS (Web Mappin Service) server and PostGIS database and provides the services / features described in the this documentation. Mappin is flexible in terms of where these input sources are located - they could be on the same network or somewhere else on the internet. Mappin also has its own built-in WMS server and PostGIS database which it uses by default. However Mappin is configured (whether to use its built-in sources or whether to use your own WMS / PostGIS sources) these sources are referred to in this documentation as the *Nominated* WMS source and *Nominated* PostGIS source. It’s important to note that Mappin looks at only one of each source type. If you wish to use maps from multiple WMS sources, you simply need to proxy (load/publish) them through the single, nominated WMS source. 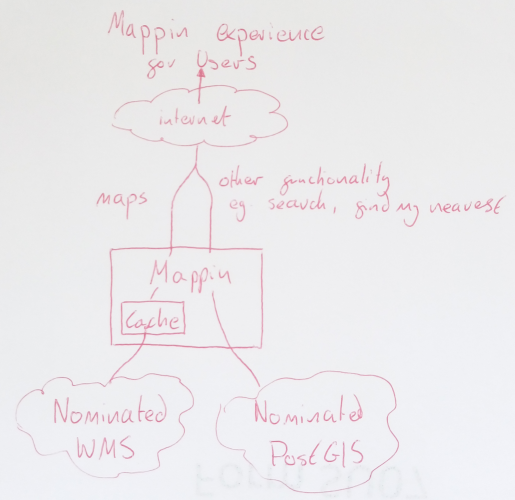 Mappin’s default Nominated WMS source is its internal WMS server (QGIS server). One key advantage of using QGIS server for WMS is that you can prepare yours layers (including styling) quickly and easily in QGIS, then upload the project file to Mappin. The published layers will then look the same as they do in QGIS. Mappin also tries to parse many layer properties (e.g. layer aliases, ordering, default visibility) from the QGIS project, populating many of Mappin’s layer settings automatically.